Tornado sirens did not sound in Creston before Saturday’s twister struck, which injured a half-dozen people and caused heavy damage in the southwest Iowa community. Union County Emergency Manager JoAnn Duckworth says she’d been watching the storm develop on radar and had seen nothing particularly threatening for her area until the EF-2 tornado dropped from the sky. “In just a few seconds, the whole situation changed,” Duckworth says. “We weren’t able to get out to sound the sirens, there just was not time. When the storm was coming through, nobody would have heard them.” Strong winds came ahead of the storm, knocking out power and knocking radio stations off the air — so no warnings came on the radio either. Cell phones were also knocked out. Duckworth says residents had been told to be on the lookout for severe weather. “We knew this system was coming in, we’d been planning on it for 48 hours and we tried to urge people to please be aware and to have those emergency plans in place,” she says. “Unfortunately, all the preparing in the world can’t stop the actual storm from coming.” Damage in Creston is widespread, including to the town’s only hospital and to Southwestern Community College. Six people were injured in Creston, one critically. 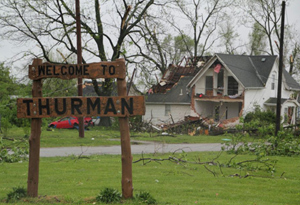 The town of Thurman was also slammed by a tornado the same day, causing wide damage to dozens of homes. Thurman pictures are courtesy of Barefoot Photography and the Creston pics are courtesy of Sean Hargis.